The thing is, everyone gets 24 hours each day. Successful time management is the “secret” to making the most of those 24 hours. 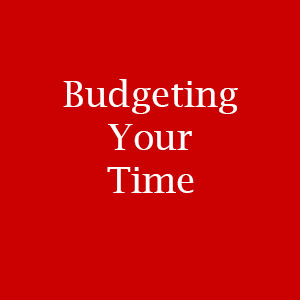 Budgeting your time is very similar to budgeting your money; you’ll want to make space in your budget for the necessities as well as the items that are most important to you. You’ll find some strategies for effectively budgeting your time below. How can you accomplish tasks if you’re not even sure what needs to be done? Listing your goals helps you create a plan for reaching them. By learning how to budget your time, you can stop putting off the things that matter most to you and start working towards them. After making a list of your activities, add in the tasks that will help you work toward your goals. Budget a portion of your time to each of the important activities on your list. Consider ways to “double up” to maximize your time. Can you commute to work by walking or biking to add some exercise into your day? Would joining a recreational sports league help you relax while exercising and socializing? Creating habits in your routine helps you budget your time effectively. Depending on the task, your routine may be daily, weekly, monthly, quarterly, or even yearly. For example, making time each month to file your receipts and other tax information could save you time when preparing your taxes. Planning ahead to take the dog to the groomer once a month makes it a part of your routine rather than a nagging task you just can’t seem to cross off of your list. You may find it helpful to schedule household chores for Saturday mornings so that you have the rest of the weekend to spend time with family and friends or relaxing with a good book. Schedule your most important tasks for Monday mornings. If the tasks can’t be completed on Monday, you’ll have the rest of the week to work on them. Each of your responsibilities should have a day and time when they receive top priority. Once your weekly work is complete, set aside time on Fridays to review your goals and how you’re using your time budget. Is there a task on your list that can be streamlined or automated? Is it possible to eliminate it entirely? The truth is, a small portion of your tasks are responsible for the majority of your accomplishments. Removing unnecessary items from your task list makes it easier for you to focus on those tasks. Find the activities where your time is most effective and structure your work around those activities. Learn to complete tasks quickly and embrace “good enough” instead of constantly striving for perfection. Make it a habit to do the best work you can in the moment you have with the resources you have available. Set deadlines and stick to them. Determine the frequency of each individual task and then add it to your schedule as appropriate. If you could use a hand with your financial budget, contact the professionals at Baker Retirement & Wealth Management, PC. Our team assists individuals and businesses with wealth management, taxes, and other financial matters. We’ve been providing financial services in the greater Evansville area for nearly thirty years. Please stop by our office in Evansville, Owensville, Newburgh, or Boonville, or simply give us a call toll free at 1-866-244-3517.